We love trying new liquors around the world, and learning more about what the world drinks. But we also love drinking them at home, once we’ve found some that we like. Sure we could just pour from the bottle, that that takes away half the fun of serving liquor at home. 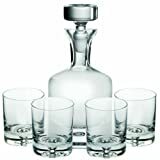 Finding the best liquor decanter set not only allows you to enjoy serving liquor at home in a sophisticated way, it also expands your appreciation of the art and dedication it takes to make great liquors. They are meant to be savored and enjoyed. Are you with us on this? If so, then we will help you choose the perfect liquor decanter set – whether you’re using it to pour your favorite whiskey, to enhance your well-stocked home bar, or as a gift for the whiskey lover in your life. We’ve put together a quick list of our favorite liquor decanter sets, in case you don’t have time, or don’t want to read the full reviews later in this post. We’ll also be covering a few different categories – luxury decanter sets, novelty decanter sets, affordable sets – so if you don’t see what you want here, scroll down for more. I prefer to say “why not?”. Serving liquor in the proper vessel is part of the experience. Enjoying a 20 or 30-year whiskey poured from an elegant whiskey decanter, I would argue, adds at least half of the enjoyment factor. Serving a perfectly aged bourbon or rum straight from the bottle is a little like serving a premium wine in a plastic cup. It’s important to have a great whiskey decanter set at home. Choosing the best whiskey decanter can greatly enhance your appreciation for the time and energy that was put into the making of that liquor. Every pour should be savored. A beautiful whiskey decanter will help you do that. I’m not saying that the decanter itself can or will do anything for the whiskey itself, however. Decanting a wine can help it to breathe and open up the flavors and aromas that have been tightly packed into the bottle for years. It can also help the sediment settle so you don’t end up with a bunch of it in your glass. But the same isn’t really true of liquor. It doesn’t need to breathe and open up like wine does. So putting it in a decanter does little to enhance the flavor and aroma. It’s really more about visual and emotional appeal. With so many options, it can be difficult to choose the right decanter. We’ve researched more than 20, and have narrowed down the options. Purchasing a decanter set doesn’t have to be overwhelming – buying a great decanter should be fun and rewarding. Our reviews will help you narrow the choices and find the right liquor decanter for your needs. What to Look for in a Decanter? The most important factors in finding the best decanter set are the weight and the material used to make it. This doesn’t have to be technical – it’s easy to decide once you know what your want. 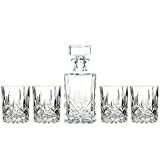 Most decanter sets are made of either glass or crystal. Of course, crystal is more expensive and many believe more prestigious. There are two main difference between glass and crystal. First of all, crystal contains some trace minerals, like lead, which can be dangerous when liquor is stored in it for a long period of time, because it is slightly porous. For regular drinking, it’s fine, but keep this in mind if you’re planning to store your liquor for a longer period of time. You may also want to pay attention to weight. Crystal decanters are quite a bit heavier than glass. However, crystal can also be made thinner than glass, so crystal whiskey glasses can offer a better tasting experience, if you’re a true connoisseur. For me, glass is the more practical choice. It’s easy to clean, less fragile, weighs and costs less. If you break it, you won’t feel quite as bad as if you break an expensive crystal glass. However, crystal definitely adds a spark of elegance to the decanter. Decanters come in many different sizes. If you want to fit an entire bottle of liquor, you want to find one that holds at least 750 millimeters. Do keep in mind that many hold less, and only a few hold more – up to 1 liter, typically. While a decanter set doesn’t have a cork, it does have a stopper that prevents air from entering the decanter. The stopper should be airtight, to prevent oxidation of the liquor. However, you don’t necessarily want a rubber stopper. It’s better to have an airtight all-glass stopper. The rubber piece can become brittle and susceptible to cracking over time, and it can begin to harbor bacteria if not properly cleaned. A complete set usually includes a decanter with a stopper, plus four glasses. Some sets only come with 2 glasses, which may be enough for you if you’re not going to be serving guests. Some sets also include whiskey stones to keep your drink at the preferred temperature. When looking for the best liquor decanter sets, be sure to take into account the number of glasses included. I also recommend noting whether you can buy replacement glasses for the set you choose, in case you break any. This list contains the decanter sets available in 2018 that we love and would recommend purchasing if you’re in the market for a decenter set. Of course, there are higher-end sets that cost a lot more than these, but we tend to stay in the mid-range when purchasing items such as this. If you’re looking for a high-end, beautiful crystal decanter set that will definitely impress your guests, the Waterford crystal set is the perfect thing. It comes with a decanter and 4 double old fashioned whiskey glasses. It’s suitable for whiskey, bourbon, scotch, rum, vodka and other liquor and alcohols. The design of this set is very classic, with diamond and wedge cuts on the side. This set is made from lead-free crystal, so it’s safe for storing your alcohol for longer periods of time. Despite the absence of lead in the crystal, the decanter has a solid, heavy base that will keep it from being knocked over. The decanter is 9.5″ tall and it holds about 28 ounces. While this is just big enough to hold a full 750 ml of liquor, it will bring the level right to the top. The glasses are 4″ tall and hold 9 ounces each, making them perfect for classic cocktails. The Ashcroft whiskey set is made with lead-free ultra-clear glass, with a stylish design that will add a bit of flair to your liquor cabinet. Despite being a glass set, it is nicely weighted and feels very sturdy to hold and pour. The set contains a decanter and 4 glasses. The decanter can hold up to 800 ml and has a glass stopper that is easy to remove. The glasses are 8oz double old fashioned glasses. This set comes packaged in an nice gift box with a metal closure that will keep it safe while in storage. It’s great to give as a gift because of its impressive packaging and beautiful design. It’s universal enough to be enjoyed by everyone. We love this decanter set because of its simple design and the fact that it is a mouth-blown, handmade decanter, made of 100% lead-free crystal. If you like simple, neat lines, this is the decanter for you. Leave all the frilly etching behind. It’s has a very elegant look. We also like that the decanter and glasses have character, because they are not manufactured, but hand blown in Europe. The decanter holds a full bottle of liquor, and the glasses hold 10.5 ounces. They have significant weight to them. 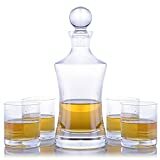 This decanter set, like the others, is perfect for any type of liquor you want to store in it. Waterford is a trusted brand for good reason. This Waterford Vintage decanter and glass set were made with modern-day consumers in mind, who want a sleek modern design with vintage appeal. You’ll be impressed with the quality of these glasses – as is evident in the weight and sparkling clarity of the tumblers. If you’re looking to impress, the Waterford Vintage set definitely will. The set is a bit smaller than typical. The glasses hold 9 oz and the decanter holds slightly less than a full bottle of liquor. The set comes packaged nicely, to make an impressive gift. See more about the Waterford Vintage Hourglass Decanter set. Not everyone can, or wants to, afford an expensive decanter set. We are sometimes prone to breaking glasses, so we want to have a set for everyday use that doesn’t cost a fortune to replace. If that’s the case for you, here are a few recommended decanter sets that are nearly half the price or less of the more formal, high-end sets we listed above. The main factors that make these sets less expensive than higher-end sets is the quality of the glass and the workmanship. Some of them may also have a rubber piece around the topper, which you won’t find in more expensive sets. The rubber can get dirty, or dry, and end up needing to be replaced. Most of us don’t tend to buy decanter sets for ourselves, unfortunately. We end up receiving these things as gifts. And what a great gift it is. 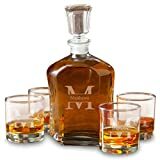 If you’re looking for the perfect gift decanter set to give a friend or loved one, you might want to go with something more personal, like this Personalized Whiskey Decanter set. It also makes a fantastic grooms gift, or groomsman gift. It can be customized with 1 line up to 10 characters – perfect for a first or last name. While the glass set itself is somewhat basic in design and quality, the monogram is what makes it special. The decanter can hold 23oz. 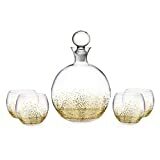 No matter how you look at it, this is a really great deal for a nice crystal decanter set. This 5-piece set is made in Ireland, and handcrafted utilizing the centuries-old traditions of crystal glass blowers and cutters. It is made with high-quality 24% lead crystal, and being crystal means it is delicate and requires special care, but if you take good care of it, it will remain a beautiful part of your bar ware for many years to come. The decanter holds 24oz, and the included four old fashioned glasses hold 8oz. The classic 1920s design complements both modern and vintage decor. Another great deal can be found on the Bormioli Rocco Selecta set. This is a 7-piece set, unlike most that are 5. When you consider the low price for this set, you can see how great of a value it is. The set includes 6 glasses instead of 4. They are each 9.5 oz. The decanter is larger than most at 33.75 oz. This set was handcrafted in Parma, Italy. Bormioli Rocco, founded in 1825, uses the finest natural resources to create superior glass products. The unique starburst design on the glass shows their dedication to craftsmanship. This Fitz and Floyd set comes in many different color styles, which makes it a very versatile choice if you’re picking something to match your decor, or choosing a gift for someone. I personally love the pounded copper set best. But this is a great choice if you don’t like the ornate etched glass you’ll find on most decanter sets. This set contains 4 glasses that are 9.4oz each, and a decanter that holds 28oz. They are made of glass that has been mouth blown and hand painted. As such they need to be handwashed. 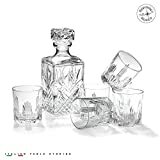 You’ll be amazed at how many fun and unique designs there are for decanter sets. If you look around, you’ll likely find one that suits your interests or defines your personality. Here are a few of our favorites. Whether you are looking for something unique to fit your personality, or a gift that’s perfect for the traveler in your life, these unique decanter sets are a fun deviation from the norm. I personally love the globe decanter. It’s elegant and sophisticated, while being an expression of your interest at the same time. Whichever liquor decanter set you decide on, you can be sure that the options we’ve listed above are offer the best craftsmanship and value. Do you already have a whiskey decanter set that you love? Tell us which one in the comments. Like this post? We’d love it if you would save it to your Pinterest board!